In case you've lost track by now, Scott Walker is the 15th Republican to announce his candidacy for President of the United States. Normally, entering this late in the race is a pretty risky move, since it means he has even less time to make up for lost ground. But if the Wisconsin Governor's proven anything to us so far, it's that he's smart about playing the game. By the look of things, he's been campaigning long before he officially threw his hat in the ring, which is probably why Walker's now a top presidential favorite among Republicans. From visiting Benjamin Netanyahu in Israel to boldly telling reporters that he believes the next President will be a governor, Walker's definitely been dropping some hints along the way — not to mention trying to retain his position in the spotlight as a Presidential hopeful. And so far, it's working. Walker has defeated Democrats not once, not twice, but three times in a blue state, and managed to pass conservative legislation in all cases. That’s remarkable, considering Walker was once facing a recall election after angering the union lobby for pushing Wisconsin towards becoming a "Right-to-Work" state. He took on nearly 100,000 protesters furious with his union-busting agenda. Even though he was facing Democrat candidate and former Milwaukee Mayor Tom Barrett, who had a strong backing from the AFL-CIO and other Democrat lobbying organizations, Walker became the first governor ever to win a recall election. And that's a pretty big deal. As he later revealed in his book Unintimidated, within the first year of his governorship, Walker turned Wisconsin’s $3.6 billion deficit into a $500 million surplus. The politician was also successful in the 2014 Wisconsin Gubernatorial election, which he won against Democrat challenger Mary Burke. Burke, who was also funded by the AFL-CIO, pulled a tight race for Walker, but in the end, he won the vote by six percent. So why does all this matter, exactly? For Republicans, it sends a simple message: Walker never sold out his conservative principles to gain reelection. Instead, he managed to still pass conservative legislation regarding gun rights, abortion, and labor unions — and still retained his governorship in a heavily Democratic state. There's no denying it — Scott Walker’s work with the 2011 Wisconsin Budget Repair Bill has made him the most hated man by labor unions and their lobbying organizations. In fact, it was a coalition of Democrats and labor union works that garnered the one million petition signatures needed to set up a recall election. But when it comes to politics, voters support political parties and politicians because they hate or are fearful of the opposition. And for many conservatives and establishment Republicans, labor unions are something they quite simply fear. As a result, the conservative movement became aggressive in supporting the Wisconsin governor in donations and grassroots efforts. Their support even continued when Walker was facing (and later defeated) Democratic challenger Mary Burke for the 2014 gubernatorial election, largely due to the backing and support from conservative non-profit organizations like Americans for Prosperity. In fact, when it came to campaign donations, Walker received $8 million alone from the Koch brothers — both primary funders of Americans for Prosperity. With the backing of conservatives, Walker was able to outspend his opponent, and defeated Barrett in the recall election by a 53-46 voting margin, which earned him a reputation as a Republican hero. That moment hasn't seemed to wear off for Republican voters yet. It also didn’t help that the AFL-CIO just released a statement on his presidential announcement, declaring, "Scott Walker is a national disgrace." Yikes. 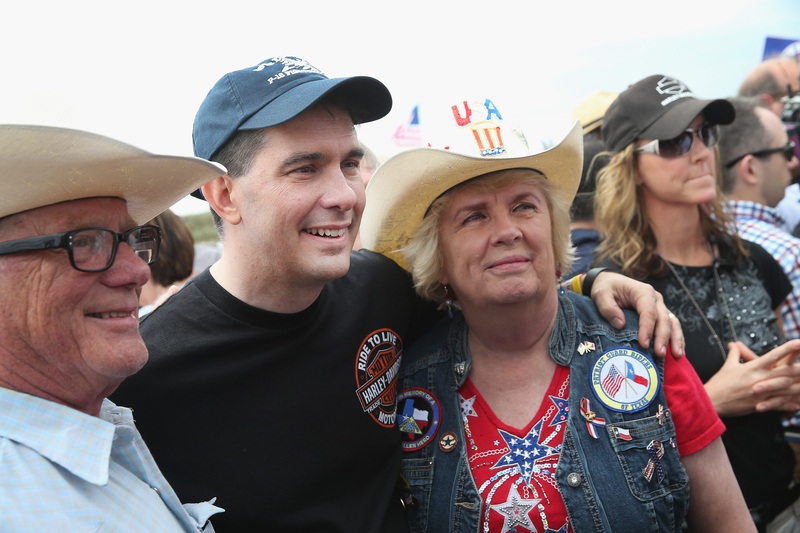 Scott Walker floats perfectly between the Tea Party and establishment Republican crowds, which allows him to remain in both their good graces. He defeated labor unions multiple times and cut Wisconsin's budget deficit, earning him some major respect from the Tea Party movement. He's also courted establishment Republicans through his staunch support for Israel, robust interventionist foreign policy, and support for unwarranted government surveillance. Walker's stood by other GOP presidential hopefuls like Senators Ted Cruz and Rand Paul by admitting that he's against the nuclear agreement proposal with Iran. Walker's wariness of Arab states building nuclear facilities is also in line with the views of other establishment Republicans. "It leaves not only problems for Israel, because they want to annihilate Israel, it leaves the problems in the sense that the Saudis, the Jordanians and others are gonna want to have access to their own nuclear weapons," the governor told Wisconsin radio host Charlie Sykes. The one area Walker may show some weakness in when it comes to Republican support is his flip-flopping on the issue of immigration. After initially condemning President Obama’s executive amnesty, Walker changed his immigration position. In fact, at a dinner with New Hampshire Republicans, he expressed that he'd be willing to allow undocumented immigrants to stay in the country while providing them with a pathway to citizenship. Needless to say, those views are not exactly favored by many extreme right-wingers and Tea Party members. But even so, Walker's strengths far outweigh his weaknesses. As a candidate, there's no denying that he strongly resonates with middle-class, everyday conservative, often referring to his humble background. In fact, Walker wowed the conservative audience at the Freedom Summit in Iowa January with a candid speech that got everyone talking. The governor mainly talked about his blue-collar upbringing, touching on his meager beginnings and even his experience with shopping at Kohl's for discounted sweaters. As a result, Walker won over legions of supporters who now see him as a down-to-earth and relatable guy. And while his political background may say otherwise, for Tea Partiers, Walker's far different than the rest of the Washington insiders he's up against — which in the end may be his biggest asset.